Towards the back of Hollywood Studios you will find the Streets of America. These are made to look like typical streets in one of three American cities. The most prominent one is New York City. You will also find Chicago and San Francisco, which is depicted here. Like everything found at Walt Disney World, this area is highly detailed. Of course these are "movie style" facades, meaning that there is really nothing behind the building fronts that you see here. However, everything that the guest can see is very realistic, right down to the props in the windows. There are several good restaurants in Animal Kingdom. Tusker House in Africa and Yak and Yeti in Asia are both excellent table service spots. However, my new favorite location is the Flame Tree Barbecue on Discovery Island. It is a quick service restaurant with only a few entree choices. However, the outdoor seating areas are amazing. 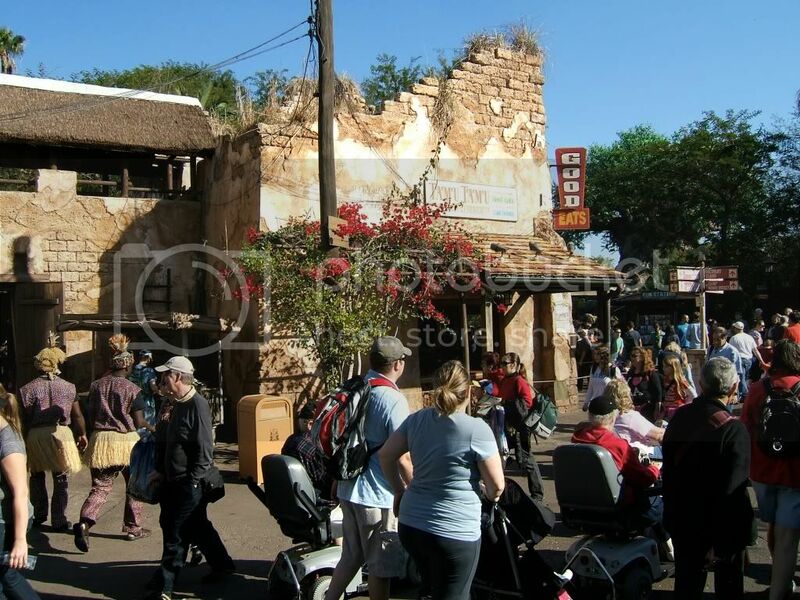 As you can see in this shot, you can sit right down next to Discovery River with a view of Expedition Everest. Even during the busiest times of day, this area is a nice "getaway." A unique thing about the tables and chairs at this location is that the chairs are adorned with animals that are typically predators, and the table tops feature typical prey. This is another detail that is usually overlooked by most guests. I was fortunate to be able to check out Storybook Circus a few days ago. This is the first phase of the new Fantasyland expansion. Although it isn't officially open, Disney did what they call a "soft opening" this month. There are three attractions that are open. Although none of them are truly new attractions, they certainly have been re-done for this area that was formally the home of Mickey's Toontown Fair. They have re-opened and completely re-themed the train station. They re-themed Goofy's Barnstormer into The Barnstormer Starring the Great Goofini. Last but certainly not least, they opened up one of the two dumbo rides. The one depicted in this picture is brand new. It actually has water at the base which ads a nice effect, especially at night. The other Dumbo is the one moved from its central Fantasyland location, and it will be opening right next to the new version. Overall, I was very impressed with what I saw in this new section of the park. Along with some new architecture, there are some great details along with a fun new story. This is from a trip back in 1983, less than six months after Epcot opened. It is a fun perspective from the monorail cockpit as guests are no longer allowed to ride up front. You can hear some of the original "Jack Wagner" audio in the background. He mentions that Horizons will be opening later that year. As we are pulling out of Epcot, take a look at the parking lot to get an idea of the era. Yes, the dorky 11 year old boy in the video is me. This YouTube video is brought to you by WDWGuidedTours.com. DDW Pic 211. DinoLand U.S.A. This street sign can be found in DinoLand U.S.A. in Animal Kingdom. It is near the restrooms that are adjacent to Primeval Whirl. You might be wondering why I would take a picture of a random sign. Well, this is another one of those hidden gems that Disney Imagineering placed in the park. Most guests don't know the significance of the number 498. However, as I've said so many times in the past, Disney has a story behind almost everything they do. So as you can imagine, this 498 was not a randomly chosen route number. It actually refers to April of 1998, which is when Animal Kingdom opened. I hope I taught you something new tonight! As I've talked about in the past, there are two types of Disney World apps. First you have the ones that are full of useful information about everything from attraction descriptions, dining locations, and resort hotels. The other kind of apps are those that focus on one specific type of information. The "Days to go WDW" app, developed by Joe Fratianni, falls into that latter category. 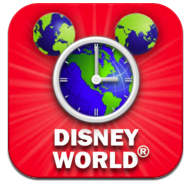 "Days to go WDW" is a simple yet fun app that counts down the days until your next Walt Disney World trip. All of the features of the "Days to go WDW" app are easily accessible by touching the little "i" on the main screen. This setup screen allows you to enter the date of your vacation and also give it a name. 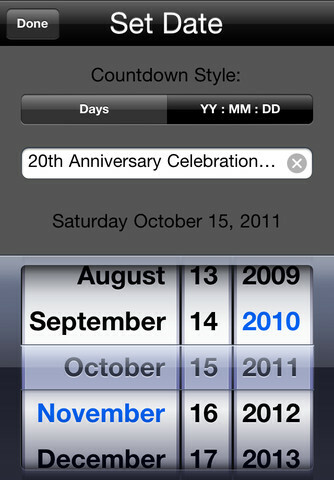 Once this info is entered, you will see the number of "Days to go" at the top and the title of your trip at the bottom. 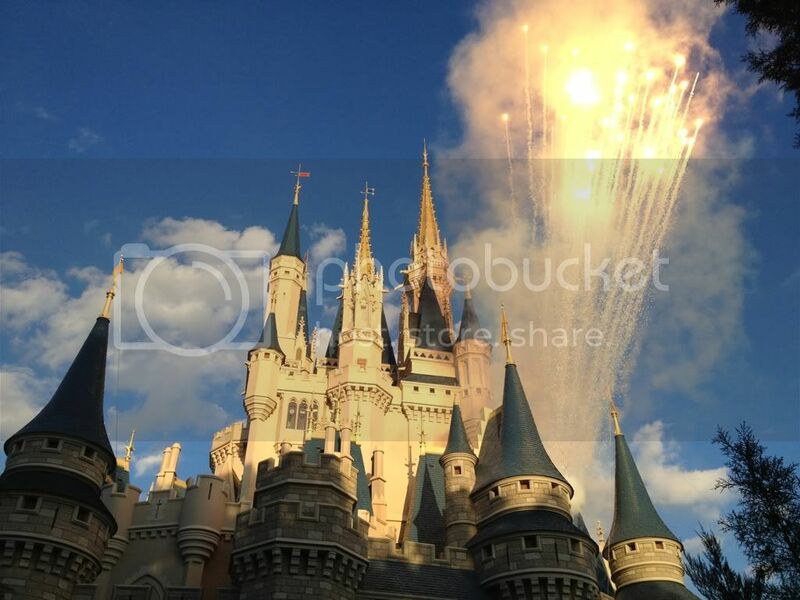 The middle of the screen will scroll through a group of default Disney World pictures or you have the option of uploading your own. The picture timing of this slide show can be managed as well. You also have the ability to customize the font, background color, and font color. This level of customization is something that I haven't seen on similar apps. Another nice aspect of this app is the "badge" feature. You can see the number of days remaining displayed in a red bubble found right on the home screen icon. You don't even have to open the app to see how much time is remaining before your next pilgrimage to the mouse. There are very few apps, other than ones developed by Apple, that can utilize this badge feature, and it is nice to see it being put to good use. Another great feature that Joe put into his "Days to go WDW" app is the ability to set up customized reminders to periodically alert you of the days before your next trip. You can set the app to notify you with an alert at any time of day that you choose. It can be repeated everyday, every weekday, on weekends, or you can customize it to specific days of the week. In addition to the visual alert, you can attach a song from your iPhone music library. If you are the type of person to download an app like this, you most likely have some good Disney tunes on your phone. It is a lot of fun to tap on the "notification" and hear music from a Disney park. Last but not least, Joe integrated a nice social media function into the app. When you tap on the little social icon, it allows you to share your excitement for your approaching vacation. You can quickly post your days remaining to your Facebook wall, a friend's Facebook wall, or you can Tweet it. This is just another fun way to utilize this already feature packed app. Overall, "Days to go WDW" is a great little app that should be on the iPhone, iPad, or iPod Touch of anyone planning a Disney World vacation. It is only 99 cents and is certainly worth every one of those pennies! Joe Fratianni obviously knows what he's doing when it comes to app development and I will be reviewing more of his offerings in the future. This picture from the Epcot International Flower and Garden Festival was taken just a few nights ago. This event takes place every year and lasts over two months. You can see that Mickey is featured in the front of the park, but there are more than 75 other great Disney character topiaries located throughout Epcot. There are also other special displays, presentations and even live music. This is a great event that lasts until May 20th. I highly recommend checking it out if you are going to be in the area any time over the next few months. Once in a while I just get lucky and snap a shot like this. I was standing on the west side of Cinderella Castle today and liked the way the light was hitting it. Just as I took the picture, a firework went off during the finale of the Dream Along With Mickey stage show. It definitely enhanced my picture! This "picture of the day" was actually taken today! It has been a long time since I had seen the Beauty and the Beast show at Hollywood Studios, and I thought it would be fun to post this one in "near" real time. This is a great show that takes place in the Theater of the Stars which was designed like the Hollywood Bowl amphitheater. Almost every structure on Sunset Boulevard was patterned after an actual building in Southern California from the 1930s and 1940s. By the way, the weather was beautiful here today, but that's no surprise! Tamu Tamu Refreshments is a quick service dining location in the Africa section of Animal Kingdom. This whole area is themed incredibly well. One interesting note about the Animal Kingdom is that there are no buildings taller than 30 feet. Disney wanted to capture the dominating essence of the landscape and didn't want the structures to interfere. This is a fun display at the exit of Buzz Lightyear's Space Ranger Spin in the Magic Kingdom. This picture was taken in January of 2011, and our little man couldn't wait to jump behind the bars to stand next to the Evil Emperor Zurg. This continues to be one of the more popular rides in Tomorrowland and it is a must see for "Space Ranger Chris" on every trip! To commemorate the 37th anniversary of the opening of Downtown Disney (which was called the Lake Buena Vista Shopping Village in 1975), I decided to post this pic of the "West Side." I took this shot from the "Characters In Flight" balloon on our trip in January of 2010. You can see Cirque du Soleil, Disney Quest and House of Blues, Wolfgang Puck, and Bongos. If you look closely at the top of the photo, you can also see parts of Epcot, Tower of Terror, and even a tiny Expedition Everest in the distance. Downtown Disney is a very popular spot to visit at Walt Disney World. It includes a large shopping area, many good restaurants, and some unique entertainment venues. 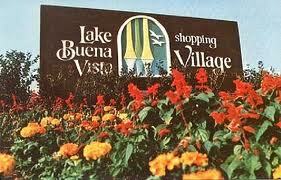 When it opened on March 22, 1975 it was a much smaller complex called the Lake Buena Vista Shopping Village. Back in 1975, this "shopping village" wasn't really intended to be a tourist destination. Shortly after the Magic Kingdom opened, Disney started building condo style units that were intended as residences where people could live on property. The Lake Buena Vista Shopping Village was built to serve this community. However, these condo units quickly evolved into resort hotel space and the nearby shopping complex became a place where tourists would visit. In 1977, the name was changed to the Walt Disney World Village. Moving ahead to 1989, Disney opened an entirely new area adjacent to Walt Disney World Village called Pleasure Island. This occurred on May 1st of that year, which was also opening day for Disney MGM Studios. Pleasure Island was an amazing complex featuring unique night clubs for adults only. It became a very popular spot with both tourists and locals. Later in 1989, the "shopping" area was once again renamed to the Disney Village Marketplace. With the popularity of the area continuing to grow, Disney decided to once again expand it. In September of 1997, a third section was added called the West Side, featuring more shops, large restaurants and a mulit-level arcade called Disney Quest. At the same time, the entire area was renamed to what we know today as Downtown Disney. So although we are saying happy 37th birthday to Downtown Disney, it is certainly a different place than when it was built in 1975! Today, Downtown Disney is extremely popular. Most guests who have traveled to Walt Disney World have visited this area. The World of Disney Store is located here and it is the largest Disney Store on Earth. It is certainly the place to go to pick up your souvenirs. Downtown Disney is a continually evolving area with stores and restaurants opening on a regular basis. There have also been several closings, including the night clubs of Pleasure Island. Back in 2008, Disney decided that they wanted to re-theme the area to be more "family friendly," but there have been very few changes to Pleasure Island to this point. It will be interesting to see how Downtown Disney continues to evolve in the years to come. Casey's corner is on the northwest corner of Main St. and is the place to go for a hot dog in the Magic Kingdom. In fact, I took this photo on a trip in January and my brother and I had dinner there that night. There is a seating area inside that is themed to an "old school" baseball stadium, and you can watch baseball cartoons on a theater screen while you enjoy your dog. At different times throughout the day a piano player entertains passersby with music from the era. This photo also shows Disney's use of forced perspective to make buildings seem taller. The first floor is 12 feet, the second is 10, and the top floor is only 8 feet. This is the same technique that is used to make Cinderella Castle look much taller. 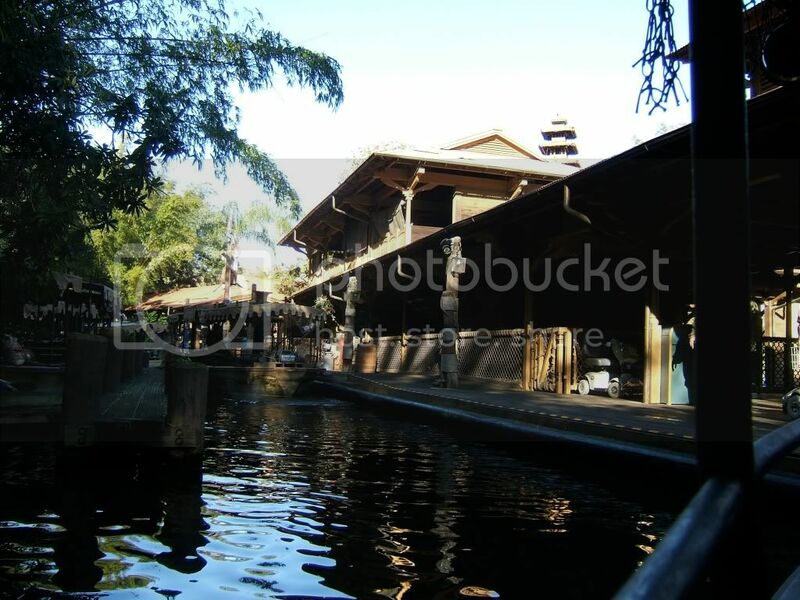 This is a shot of the dock of the Jungle Cruise at the end of our ride. There is some great scenery and numerous props to see as you exit the boat. Unfortunately, most people quickly leave the area as they are in a hurry to get to their next ride. I highly recommend taking your time in both the entrance and exit queues of the Jungle Cruise. This is one highly themed area that is not to be missed. This is a 2007 on-ride video of Expedition Everest at Animal Kingdom in Walt Disney World. Everest is one of the most unique and technologically advanced roller coasters out there. If you have never ridden it, this will give you a pretty good idea of what to expect on this very popular attraction. This is a shot taken in January of 2010 of Primeval Whirl, the spinning coaster in Animal Kingdom. The planet shown here has at least one "hidden Mickey" made out of three craters configured just right. Primeval Whirl is located in Dinoland U.S.A., and more specifically at "Chester and Hester's Dino-Rama," which is set up like a carnival midway. Although this area of the park has been criticized for not sticking closely to the animal theming (although Dinosaurs were certainly animals), it is certainly a favorite of young children. Besides the carnival area, there is also a great playscape where kids can run free while parents take a load off! 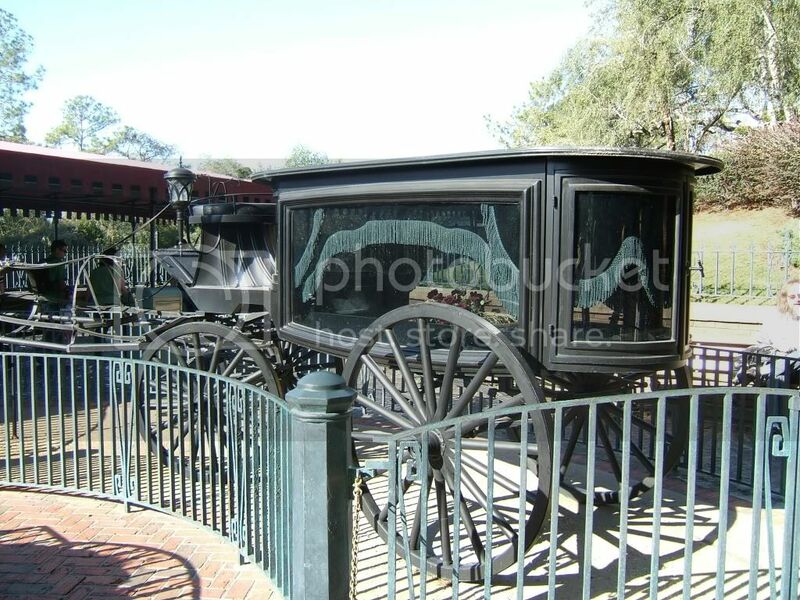 The hearse in front of the Haunted Mansion is an interesting prop for several reasons. It is being pulled by an invisible ghost horse. It contains a rotting rose bouquet where the casket is normally placed. Finally, this specific hearse was used in the 1965 John Wayne movie, "The Sons of Katie Elder." Again, there are hidden details and stories behind almost everything you see in the Magic Kingdom. There are many smart phone apps that provide attraction wait times for Walt Disney World. Some of these rely on user submissions and some use historical data to provide estimates. 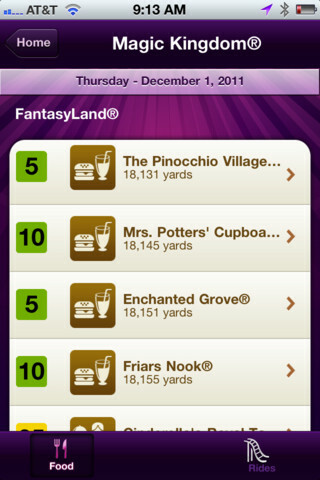 The Disney Mobile Magic app, which I reviewed last month, gives us the "posted" wait times from the parks. None of these apps are perfect, but most of them give us pretty decent information that can help us make good decisions while touring Walt Disney World. The latest addition to the wait time category is called the "Disney World - Free Wait Times App." This Disney World app was created by Apptasmic, a company based in Celebration, Florida, right outside of the Vacation Kingdom. In the description found in iTunes, the company touts it as "the app made by locals, most used by locals." This is a good thing for an app that utilizes user submitted wait times. It stands to reason that if the owners of Apptasmic are based right near the parks, they will be collecting and submitting accurate wait times on a regular basis. As I already mentioned, there are dozens of apps that provide attraction wait times. However, the Apptasmic creation is unique in a way that makes it stand out from the rest of the apps that I have found to this point. It includes wait times for the restaurants at Walt Disney World! This is a great feature that can prove to be very valuable. There have been many times when I've walked a long distance to get to a favorite eatery, only to find out that there was a longer than tolerable wait. The app includes food locations from all four parks, Downtown Disney, and the Boardwalk area. There is another relatively unique aspect of Apptasmic's Disney World app that I haven't seen before. It is the ability to take this free app and add individual components for $.99 each. The "full" version of the app is $3.99, but the developers recognized the fact that some users may only want a few of the add-ons, so they made them available individually. The four available upgrades are Disney Maps, Descriptions, Tickets, and Remove Ads. All of these additions look valuable, however, I think it was a good move by Apptasmic not to force them into an all-or-nothing paid app. I can see other companies following in their footsteps by using this incremental upgrade style. If you are planning a trip to Walt Disney World in the near future, it is a no-brainer to download the free version of this app. It could also make sense to add on some upgrades or just splurge for the full version. The restaurant aspect alone makes this app a "must have" on your iPhone's Disney page. This is a view of the Saratoga Springs Resort from a boat on Village Lake near Downtown Disney. We stayed here on our first DVC trip back in December of 2010. Saratoga Springs is a huge resort situated on 65 acres. It opened in 2004 and is themed to an 1880's Victorian, upstate New York lakeside retreat. Also located at this resort are the very unique Treehouse Villas. One of the most enjoyable aspects of the World Showcase at Epcot is the live entertainment. Pictured here is a small group of actors putting on an improv style production of "My Fair Lady" in the area of the United Kingdom pavilion. It is a very funny show in which the audience gets involved. Several guests are chosen to actually take part in the skit. Almost every country offers some sort of live entertainment, and you can spend the better part of a day enjoying different performances from around the "world." This video shows some of the highlights of Illuminations at Epcot. It was taken from a waterside platform at the United Kingdom pavilion. This is definitely one of the best areas to watch this amazing show. It is from our big family trip in 2009. There were a total of 12 of us in the group, including 4 young kids. Thankfully, all of them liked the fireworks. I had a fireworks phobia as a kid so I'm glad my son didn't inherit that gene! Here is an aerial shot that I took on a trip back in December of 2008. You can see the entire Polynesian Resort as well as the Transportation and Ticket Center and much of the Magic Kingdom parking lot. Two Magic Kingdom ferry boats are docked at the TTC. You can also see the Wedding Pavilion toward the bottom of the picture. It is always fun to see things from this perspective. It makes the "World" seem a little smaller. I like this shot from January of 2009 simply because I feel it shows the beauty of Central Florida in the winter. I remember it being a cool morning with the temperature around 60 degrees. With the bright sunshine and low humidity, the blue sky was a nice backdrop for the palm trees. This photo was taken from the pathway between Journey into Imagination and the World Showcase. One of my favorite things to do at Epcot is to head to the World Showcase Lagoon in the morning. Although the countries don't open until 11:00 am, it is a quiet and peaceful area to enjoy a morning coffee. This is footage that my dad shot from the Magic Kingdom parade in March of 1983. It is fun to see the old costumes and some of the old characters that you don't see too often anymore. It is also kind of funny to see the 80's hair styles and fashion in the crowd! This shot was taken at the character breakfast at Hollywood & Vine in Hollywood Studios. My little man was about to high five Leo from the Little Einsteins as my mom and niece looked on. In addition to the fun characters, it features one of the best breakfast buffets in all of Walt Disney World. When I started Digital Disney World in the beginning of 2011, I decided that my focus was going to be connecting us to the Vacation Kingdom using modern technology. Over 100 articles later, I continue to stick to that premise and I'm "expanding" my use of technology to help you enjoy a little more Disney World in between actual trips. Way back in March of last year, I wrote an article all about YouTube. We all know that the parks that Walt built are some of the most photographed spots in the world. It stands to reason that they are also some of the most videoed as well. This is especially true since cell phone video cameras have reached the quality of many camcorders. Like most of you, I have enjoyed watching YouTube clips containing anything and everything from Walt Disney World. I am excited to announce that I've finally started my own YouTube channel to share some of my favorite videos with you. 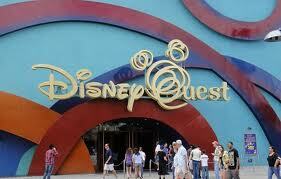 In addition to Digital Disney World, my other primary focus has been the development of WDW Guided Tours. As I've mentioned in previous articles, I give unique "One Day World Tours" of all four theme parks. A few months ago I decided to record short clips of the attractions we see on the "Classics Tour" to produce a promotional video. I finished this little commercial last week and attached it to my website at WDWGuidedTours.com and also posted it here on the blog. After discussing it with the other members of my organization, it just made sense to publicize it on YouTube. Hence, a new YouTube Channel was born. Now, some of you may be wondering what a YouTube "Channel" actually is. Quite honestly, I wasn't completely familiar with the term until recently. Simply stated, a YouTube channel is a dedicated spot on YouTube.com where users store and share their videos. 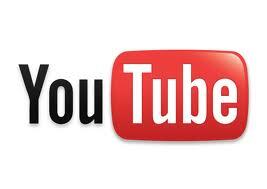 If you want to see all of the videos posted by a specific person (or company), you go to their YouTube channel. It is somewhat similar to going to a TV channel to see a certain type of program, like ESPN for sports or The Weather Channel for weather. In the case of YouTube, you can go to the WDW Guided Tours Channel to see videos related to Walt Disney World. Prior to the invention of the personal computer, there were very few ways to "stay connected" to Disney World, other than through pictures or home movies. My dad was on the cutting edge of technology when he purchased our family's first camcorder in 1983. It wasn't like anything you see today. He had to wear the actual "tape deck" over his shoulder, which probably weighed close to 10 pounds. Connected to this unit with a long cable was the a video camera that resembled a mini grenade launcher. However cumbersome this set up was, my dad captured some of my greatest childhood memories with it, including several Disney World trips. The apple didn't fall too far from the tree, as I also have a camcorder in my possession on a regular basis. The difference is that mine fits in the palm of my hand. After posting my WDW Guided Tours commercial, I decided that I couldn't stop there. I have over 15 hours of Disney video taken over the last 5 years, and thought it would be fun to start sharing some of these clips. Obviously much of this is family related, but I certainly have quite a few attractions and shows in the mix. In addition to the video that I've personally shot, I have recently started converting my dad's vintage footage into digital format. I wonder if I should have asked his permission before I started posting these 30 year old classics onto YouTube? The great thing about his stuff is that there is video of attractions and shows that no longer exist. I think that Disney World nostalgics (like myself) will really enjoy these old VHS clips. At this point, I have posted a total of six videos on the WDW Guided Tours YouTube Channel. I plan on adding more on a regular basis. All you need to do to find my channel is click on this link. You can also type "WDW Guided Tours" in the YouTube search bar and find my videos that way. Once you click on one of the videos, you can "subscribe" to the channel so that it will be easy to find in the future. I really hope you enjoy this additional way to stay connected to Walt Disney World. This is a close up look at the "rocket" ride vehicles from Space Mountain. They are made up of two cars with three seats in each. On this modern version, each guest has his own seat. However, in the old days, guests basically sat "stacked" against each other without individual seat backs. Shortly after this shot was taken in January, we hopped in our rocket and the ride temporarily broke down before we launched. However, in true Disney fashion, every guest in line was given a universal FASTPASS to ride any ride they wanted for the rest of the day. 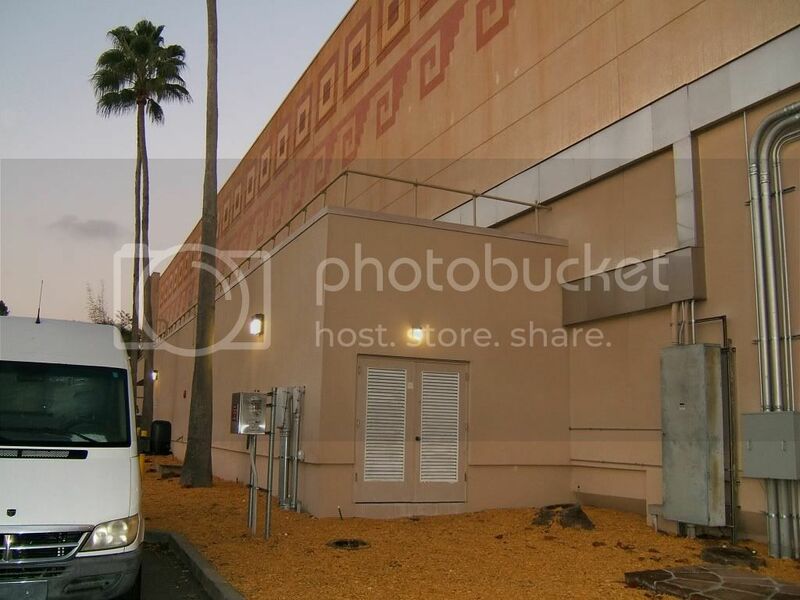 Although this picture of the Mexico pavilion at Epcot is less than exciting, it is rare nonetheless. This backstage shot was taken while running the 5K back in January. It was amazing to me that Disney didn't ask runners to refrain from taking pictures in areas that were normally inaccessible to guests. Without this limitation, I felt an obligation to snap as many photos as possible. Although my running partner (my brother) was slowed by my photography antics, he understood that this opportunity for unique pictures couldn't be passed up. He was a good sport! DDW Pic 193. Lights, Motors, Action! This is a live action shot of the Lights, Motors, Action! Extreme Stunt Show in Hollywood Studios. Yes, that IS a person fully engulfed in flames! This is an obviously exciting show that gives us a glimpse of how stunts are done in the movies. It is similar in concept to the Indiana Jones Epic Stunt Spectacular, however the focus of this show is cars and motorcycles. It takes place in one of the largest venues in all of Walt Disney World which has a capacity of approximately 5,000 guests. The attraction opened in 2005 and this picture was taken in 2006. This shot of Liberty Square was taken from the walkway between the hub and Adventureland. You can see some of the shops in the center as well as the bridge on the far right. Cinderella Castle is located just to the right of the bridge. The water is part of the moat that goes in front of the castle and circles the hub. It used to be home to the Plaza Swan Boats attraction that existed in the 70s and early 80s. Just a few days ago, the world lost a great Disney legend. 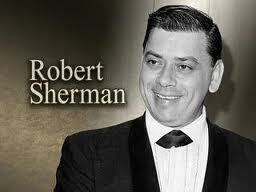 Robert Sherman passed away at the age of 86. He and his brother Richard were the amazing song writing duo known as the Sherman Brothers. They composed so many Disney favorites including all of the music for Mary Poppins. They are also known for much of the music we hear in the parks like the "Tiki, Tiki, Tiki Room," "Winnie the Pooh," "One Little Spark," and "There's a Great Big Beautiful Tomorrow," to name a few. 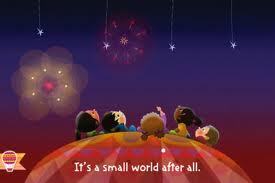 However, their most popular and significant piece has to be "it's a small world." Disney fans owe a huge debt of gratitude to the Sherman's for bringing us such joy with their music. Although Robert is gone, his music will truly live on forever. In his honor, I would like to feature a relatively new iPhone and iPad app put out by Disney. The "it's a small world" app takes us on a fun journey through an animated version of the beloved attraction. 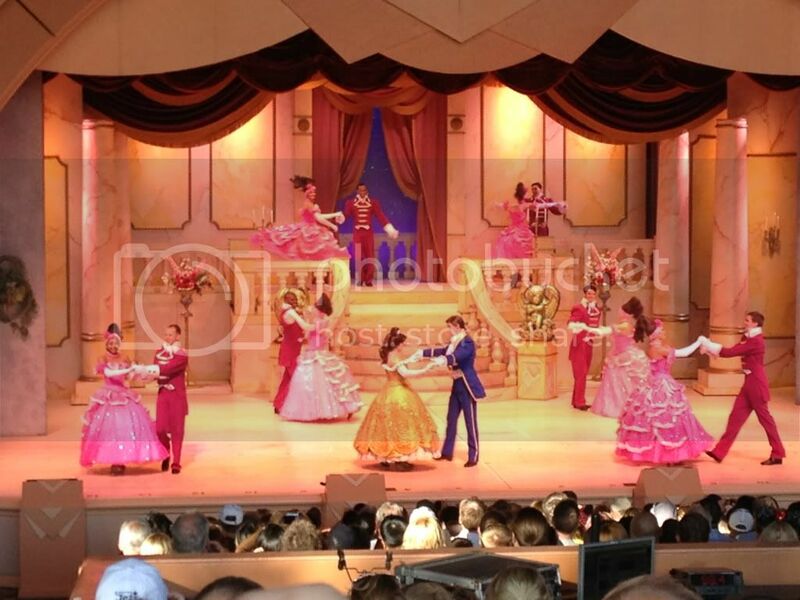 It contains 15 scenes from all over the world that contain the children and animals that we see on the ride. Each scene features one line from the song that is spoken in a child's voice. As the scenery moves by at a very slow pace, we can touch different objects on the screen that elicit interactive responses. For example, when we touch on a child playing an instrument, that instrument gets louder and the musician does a little move. As each scene draws to a close we are brought into the clouds via hot air balloon and then lowered into the next area. We also have the ability to slide our finger to move backward in a scene, as to not miss any of the interactivity. In addition to the fun of exploring each area of the world, this app concludes with two special scenes that relate to the actual ending of the attraction. In the very last part of the ride, there are brightly painted, two dimentional cut-outs with the words for 'goodbye' written in languages from around the world. In the app, the second to last scene has children sitting on the branches of a tree. When you tap on one, he will say goodbye in his language and the written word will also appear. The final scene in the app is a sing-a-long of the full Sherman Brother's tune where you can follow the "bouncing ball" over the written words of the song. It features five children lying on their backs, looking up to the stars. You can tap anywhere in the sky to set off random, multi-colored fireworks. The "it's a small world" app is fun for all fans of the attraction. Although the interactivity and exploration aspects are certainly aimed towards young children, this is a must have app for any small world nostalgic. It definitely captures the feel and message of the attraction. Like many interactive apps, this one is easier to use on the iPad, but does just fine on the iPhone. I will say that the $3.99 price tag is a little steep, but the level of detail seems to warrant the cost. Considering the price for one day in the Magic Kingdom is nearly $90, four bucks doesn't seem that bad to take home a little of the magic! This post represents another first for Digital Disney World. In over six months of posting a "Picture of the Day," I have never featured a video. In a shameless act of self promotion, I am changing that tonight. I finished editing a small promo for my WDW Guided Tours company and thought that it would be fun to share. These are all clips that I took with my iPhone on our trip in January. I wanted to give potential customers a general idea of the attractions we would see on my One Day "World Tour." This particular video highlights the "Classics" tour and I plan to have one produced for the "Thrills" in the future. I am very excited about the direction of this business. There are so many people who ask me what to do if they only have one day to spend at Walt Disney World. There is no reason to limit yourself when I can show you the best in all four parks. If you like the concept, visit WDWGuidedTours.com and please help spread the word! This picture inside of Snow White's Scary Adventures, shot in January, will probably be the last one I ever take. It has been know for a while that this attraction would be closing sometime this year. Disney finally made the announcement that the closing date will be May 31st. Although it will be sad to see this opening day classic shut down after 40 years of entertaining guests, there is a silver lining. As part of the Fantasyland expansion, the Seven Dwarfs Mine Coaster will be opening next year and the story of Snow White will live on at the Magic Kingdom. Also, they are turning the current location into Princess Fairytale Hall which will be an elaborate new meet and greet area for Cinderella and her friends. 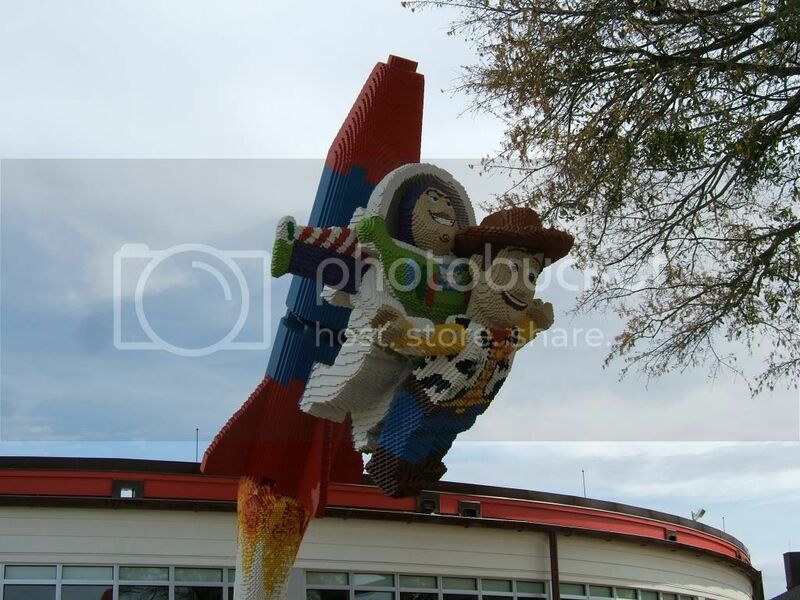 This shot of Buzz and Woody is from right outside of the Lego Store in Downtown Disney. This store was remodeled last April and is bigger and better than ever. Also, they just opened LEGOLAND Florida down the road in Winter Haven. This appears to be a pretty impressive amusement park that we'll have to visit soon, now that our son is a big Lego fan. This shot of the Nanea Volcano Pool at the Polynesian Resort was taken last week. It was a peaceful view of a pool that is usually very busy during the day. The whole atmosphere at this resort is very different at night. It is fun to just stroll around the grounds among the tiki torches and palm trees. They were also showing Beauty and the Beast on a huge inflatable screen on the beach that night. Although it was chilly, we covered up with beach towels and caught the last couple scenes. Again, there is a lot of great stuff to enjoy at Walt Disney World outside of the parks. There are many Walt Disney World blogs to be found on the internet these days. I have reviewed alot of them on this site over the last 15 months. It is great to see so many Disney fans jumping into the online community. However, sometimes new blogs pop up but fade just as fast. Many of them are started with good intentions, but often times the authors get busy and stop posting. Also, many people don't realize the time and effort that it takes to keep a blog current and relevant. Now that I have been writing Digital Disney World for over a year, I have a great deal of respect for those who consistently publish great posts on a regular basis. Amanda Tinney and her Disney Every Day blog certainly fall into this category. 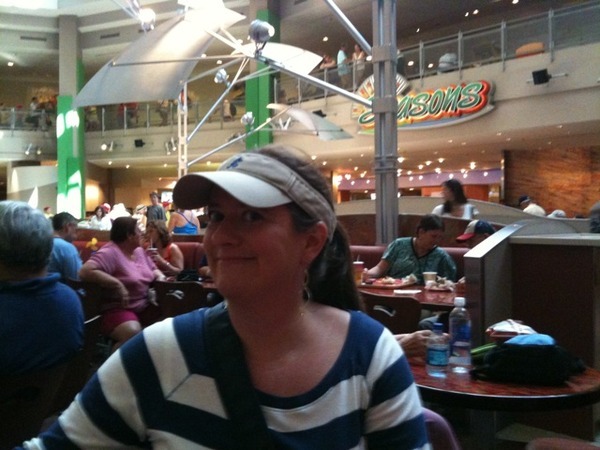 Amanda has been authoring Disney Every Day since the middle of 2009. Although her posts can be about any Disney subject, the majority are related to Walt Disney World. Much like my blog, Amanda will post quick little snippets as well as full length articles. She posts alot of videos including movie trailers, resort tours, and news clips. She also includes great photos with most of her articles. One thing that really sticks out about the content on Disney Every Day is that it often highlights a current event in the world of Disney. Some examples include a recent video of the new Disney Fantasy Cruise Ship, a photo challenge related to last week's One More Disney Day promotion, and a post about upcoming St. Patrick's Day happenings at Downtown Disney. There are Disney blogs that are written from all over the country and some that even originate from overseas. However, I enjoy finding bloggers who live in the Central Florida area because they are living right near the Disney magic. Amanda is part of that lucky group. She is a resident of Florida who has lived pretty close to Walt Disney World for most of her life. Her father was a cast member in the 70's and she also worked there for short time. Like many of us, if she had it her way she would live IN "the World," but at this point Disney doesn't let people move into the Kingdom. 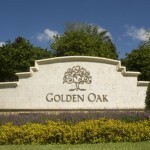 Although, with the new Golden Oak Residential Community taking shape, that dream will soon become reality for some folks. I highly recommend checking out the Disney Every Day blog over at DisneyEveryDay.com. 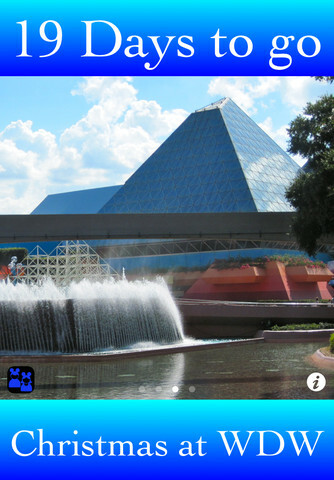 It is a great site to visit to get a quick Disney fix. Amanda updates it on a regular basis and there is always something new to look forward to. She certainly has her finger on the pulse of Disney current events, and she does a great job of keeping us in the loop. This shot of our building at Old Key West was taken last weekend. We were on a trip to South Florida to visit relatives, but of course we just HAD to make a quick pit stop on the way home. That is one of the nice things about being DVC members. I was able to call the day before and get a room for the next night. We didn't even go into the parks, but had a great time anyway. After lunch with Amy and Craig Petermann (from the Relocated Tourist blog) we hung around Downtown Disney. We then headed to the Polynesian and had fun riding the monorail with our little guy. We capped off the night watching the Electrical Water Pageant on the Seven Seas Lagoon. Even without riding the rides, it was still fun spending a couple days at our "home away from home." Here is another fun "on ride" shot that I took in January. Disney does a great job of creating amazing special effects in many of the attractions, and Tower of Terror is certainly no exception. This ghostly hallway scene takes place when the ride vehicle stops during its ascent. There is so much to enjoy about this ride before you even get to the out of control elevator thrills. This is a perfect example of how Disney differentiates itself from every other amusement or theme parks. The complete immersion into the Twilight Zone story makes this attraction one of my all time favorites. This shot of Figment was taken inside of Journey Into Imagination at Epcot. Along with the Dreamfinder, Figment was a main character in the original attraction from 1983 to 1998. In 1999, Disney decided to completely makeover the ride and it became Journey into YOUR Imagination. Much to the dismay of most Disney fans, the new version did not include Dreamfinder OR Figment. However, in 2002, they came to the realization that Figment should never have been removed and he reprised his role in the current rendition. This latest version is still not "the original" and doesn't include Dreamfinder, but at least we have the little purple dragon back to entertain us. This shot, taken in January, is looking north from the Transportation and Ticket Center. I was standing on the walkway that connects the Magic Kingdom and resort platform to the Epcot platform. You can see the Contemporary Resort in the distance. If I turned to my left I would be looking out towards the Seven Seas Lagoon. As you can see from the sky, it was another beautiful day in Central Florida.